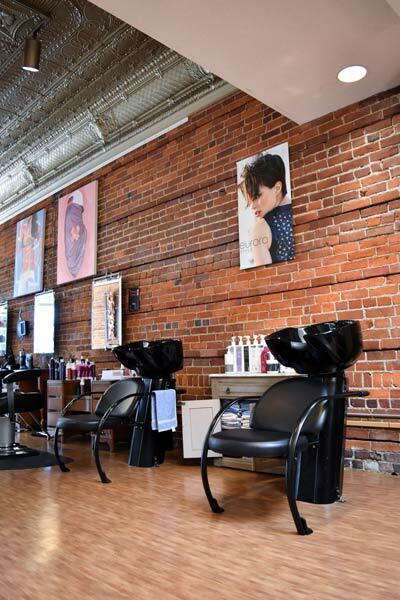 Take a Virtual Tour of H2o Salon! Welcome to H2o Salon! We're so happy to have you visit us! We are located at 109 North Broadway in Urbana, IL. We are two blocks north of Lincoln Square Mall, next door to the American Legion. There is metered parking both in front of our salon and behind it, along with a parking garage one block south on Broadway. On weekends, metered parking is free! If you take the bus, we are only one block from the Lincoln Square stop for several lines of the MTD. Let's get started on the tour, shall we? When you first arrive at H2o Salon, you'll be greeted by one of our awesome 'HairTraffic Controllers' at the Welcome Station. Here you can see Jenna working hard on scheduling appointments and services for our fantastic clients. You'll be offered a drink when you first arrive, and then you'll be checked in for your appointment. The HairTraffic Controllers are here to help you with any questions or needs, so feel free to say hi! Delicious coffee at the coffee bar! After you get checked in by one of our lovely HairTraffic Controllers, you can grab some complimentary coffee at our coffee bar! Our selection varies often, and is brewed fresh each day. We also offer a selection of teas, sodas, and water—all on the house! Just let the HairTraffic Controller know what you'd like, and they'll get it for you right away. Have a seat in our comfortable waiting area, where you can read any one of our selection of magazines, peruse the art and jewelry displays by local artists, or enjoy our free wifi service, which is available to all our guests. Your stylist will be with you soon! Across from the waiting area, we have a selection of wonderful haircare products for you. We sell Eufora brand haircare and styling products, with selections ranging from their Smooth'n treatments for frizz control, Curl'n products for curl care, and Bodifying solutions for thin, fine, or straight hair. Eufora promises beauty without compromise, including ecologically responsible harvesting of all their ingredients and fair trade practices for their suppliers. H2o Salon is proud to offer Eufora products for your haircare. We also have a styling tools, including the Beachwaver, flat irons, and blow dryers. On the bottom shelf, you can even find detangling tools such as the Tangle Teezer. Be sure to check out the product displays during your visit! Ready for a great new StylE? Once your stylist is ready, they'll lead you over to their chair. If this is your first appointment, your stylist will spend a few extra minutes with you before they get started on your hair. They'll talk to you about what you want to do with your hair, look at any pictures you've brought, and discuss your vision for your ideal style. We pride ourselves on helping our clients realize their hair goals, so feel free to tell your stylist what you want to try! Get ready for your great new style! Once you and your stylist have discussed your style plans, it's time to head on over to the Relaxation Station. At H2o Salon, we want you to experience the difference, so not only will we wash your hair with Eufora products specialized for your hair type, but we also provide a luxurious scalp massage free of charge. You might just fall asleep, it's so relaxing! Sit back, relax, and experience the difference that is H2o Salon! Does your service include color? Then you're in for a treat at our fantastic Color Bar! Plug in and charge your devices, whether you have a laptop, tablet, iPhone or Android phone, and work or surf the web while your color processes. We also have a selection of magazines available for you. Would you like another drink? Great! Just let a stylist or HairTraffic Controller know and we'll get you another complimentary cup of coffee, tea, soda or water. Whatever you'd like! Want help learning to do your own makeup? Interested in trying a new technique with the help of a professional? We offer it all at H2o Salon! Whether you'd like a makeup lesson, or want makeup done professionally for a wedding, special event, or photo shoot, our talented makeup artists can help perfect your look! Right this Way For Waxing and Nail Services! At H2o Salon, we offer a variety of services, including waxing and nails! Just to the right of the color bar, you'll see a door to another hall. At the start of this hallway, you'll find access to the nail station and wax rooms. Just turn through that brightly lit doorway you see directly to the left, and you'll be in the nail and wax room area. If you're in need of a restroom, don't worry. We have an all-gender restroom available for our clients. Stay in this hallway (not the nail or wax area) and head all the way to the end. The all-gender restroom will be on your left. Directly inside the wax and nail area, you'll find the nail station. We offer a variety of choices, including polish in a wide selection of colors, and shellac/gel manicures and pedicures. For those who only want their nails and cuticles trimmed up, we even offer an 'express' option with no polish at all. Sit back and relax in the pedicure chair, or get your fingernails done at the table. There are so many options for your nail care at H2o Salon! This way to the Wax Rooms! Ready for a Wax Service? Past the nail station, you'll find the Wax Rooms. At H2o Salon, we have two separate wax rooms available, giving you twice the opportunities to schedule an appointment! We provide a number of waxing services, including eyebrow and lip wax, back waxing, leg and arm waxing, and Brazilian waxing. You can see our full selection of waxing services on our Menu page, or call the salon and speak to a HairTraffic Controller to schedule your appointment today! In our wax room, you'll find a relaxing environment surrounded by local art and delicate crystal displays. Don't worry! Our stylists will visit with you before beginning your service to discuss your waxing needs and concerns, including any allergies or sensitivities you might have. We pride ourselves on taking great care of our waxing clients, so please let your stylist know of any concerns. And This concludes our tour! So here ends our photo tour of H2o Salon! We hope you've enjoyed your virtual visit, and that we'll see you in person soon! If you'd like to see all the service options available at H2o Salon, please travel over to our Menu page where you can see our color, cut, nail, and waxing service choices! If you want to check out which stylist or technician might be best suited to your needs, visit the Stylists page or our Nail Technician page! Ready to schedule your appointment? Great! Click here to visit our Appointments page and discover all the ways to contact us or schedule online today! Thank you for taking our tour! We hope to see you soon! Thanks for visiting H2o Salon! Call 217-337-1480 to schedule your appointment today!